We are pleased to let you know that we have completed our project documenting the facades of the structures along Via dell'Abbondanza in Pompeii, and that our book describing the work has recently been published by Lockwood Press in the United States. The publisher's announcement below briefly describes the contents. 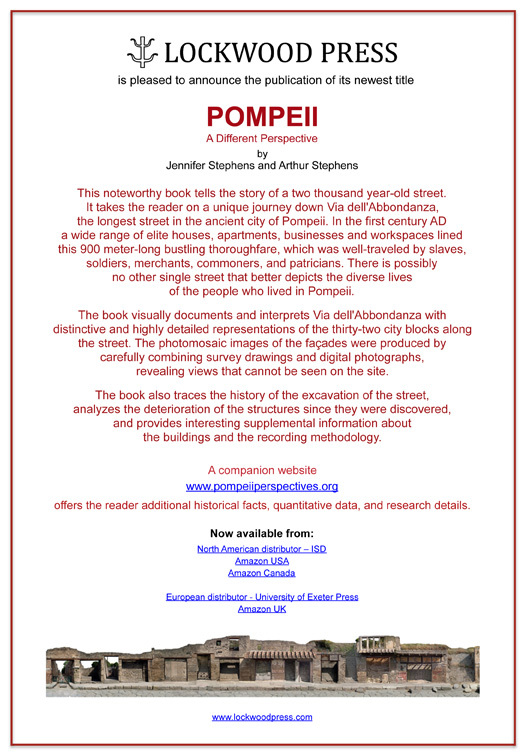 We have also updated our project website (www.pompeiiperspectives.org) to be a companion to the book. The North American book distributor is ISD, and the European distributor is the University of Exeter Press. The book is also available from Amazon USA, Amazon Canada and Amazon UK.